Veröffentlicht am 16. Januar 2019 von Julia Werner & Kategorie Allgemein. Vom 16. – 19. Januar 2019 findet am ITM ein rechtsvergleichender Workshop zum Informationsrecht in Deutschland und Brasilien statt, zu dem Mitglieder des Forschungsprojektes „Study Group on Copyright and Industrial Rights (GEDAI)“ eigens aus Brasilien anreisten. Das ITM heißt die brasilianischen Forscherinnen und Forscher herzlich willkommen. Geleitet wird die Veranstaltung von Prof. Dr. Marcos Wachowicz, der als Gastwissenschaftler am ITM zu urheberrechtlichen Fragestellungen und zur Regulierung von Blockchain forscht. Die Vorträge decken verschiedenste Fragen des Informationsrechts ab, als Beispiele seien unter anderem „Blockchain technology and the economic institutions of capitalism“, „Copyright and cultural diversity in the information society”, „Copyright and Public Domain of Information” genannt. Der wertvolle Informationsaustausch während des Workshops stärkt die guten Beziehungen zwischen dem ITM und den Wissenschaftlerinnen und Wissenschaftlern des GEDAI. The ITM is pleased to announce that from January 16 to 19, 2019, it is hosting a workshop on comparative law concerning Information Law in Germany and Brazil. 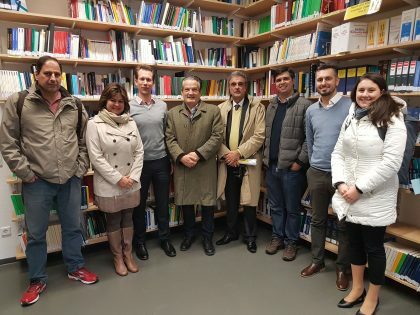 The workshop is attended by members of the research project “Study Group on Copyright and Industrial Rights (GEDAI)” who have travelled to Münster from Brazil specifically for this purpose. The ITM welcomes these researchers cordially. The workshop will be led by guest researcher Prof. Dr. Marcos Wachowicz, who has joined the ITM to work on copyright issues concerning the regulation of blockchain. The presentations will cover various Information Law problems such as “Blockchain technology and the economic institutions of capitalism“, “Copyright and cultural diversity in the information society” and “Copyright and Public Domain of Information”. The workshop offers the opportunity for a valuable exchange of information which will consolidate the strong relations between the ITM and the researches of GEDAI.